1. 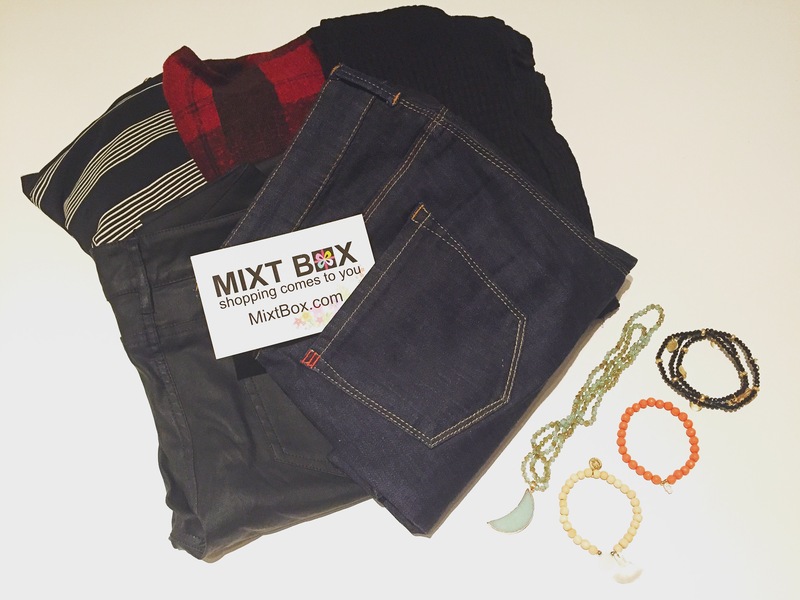 Jeans – These are my fav item in the box. I was super skeptical about getting jeans but couldn’t believe they actually fit me like a glove! They are perfectly my style and I have been wearing them all the time! How hard is it to find jeans to begin with, I hate shopping for jeans because they never fit right and I’m super picky about the colour of the jeans, but these ones are perfecto! 2. Plaid shawl – This is my second fav item, it’s perfectly my style and goes great with those jeans! 3. Leather pants – Holy! Never had leather pants before and I’m kinda digging them! Fun! 4. Black sweater – this one is a little see-thru and cute. 5. Black and white top – this one isn’t my style but the rest of the box makes up for it! 6. Half moon necklace – love the colour of this necklace! 7. Bracelets – the black one isn’t my style but the other 2 I have been wearing almost every day!